Morning all! 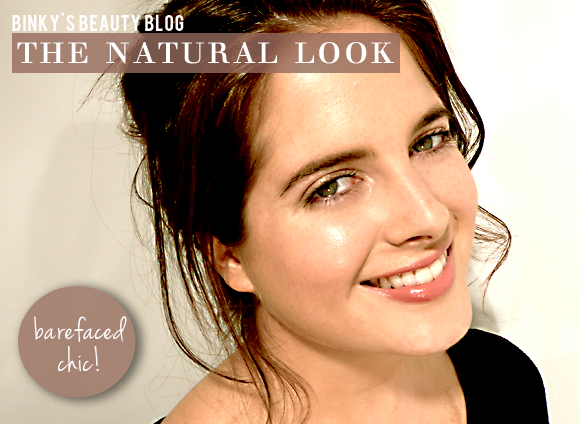 A big shout out from Binky’s Beauty Blog. If you think I’m sounding unexpectedly perky this chilly autumn morning, it’s because I’ve got my game face on – I’m feeling super confident and ready for any surprises that come my way this week. There are no flies on Binky, right now. I’ve learned from experience to follow the Girl Guides motto and be prepared, at least when it comes to how I look. You see, I dropped the ball, beautywise, the other day, and I swore to myself that I won’t let it happen again. Let me explain. Okay, so we all love a surprise, don’t we? But sometimes a girl needs a little advance warning that a surprise is coming her way. So yesterday afternoon, I was chilling out at home. I’d been to the gym and I jumped in the shower as soon as I got back. There I was, wet hair, not an ounce of make-up and dressed in my saggy old trackie bottoms and an old sweatshirt. Suddenly the doorbell goes and it’s this cute guy from a few doors down, wanting to borrow some milk (not exactly the most original way to start a conversation, but hey, at least he’s having a go!). I’d spotted him moving in a few weeks ago, there’s been a bit of flirty smiling and waving at each other when we pass in the street. Now here he was on my doorstep, and I looked a mess. Instead of enjoying the attention and taking my chance to chat, I chucked a pint of milk at him a slammed the door in his face. Disaster! You know how it is when you meet someone you like the look of – you want you want to feel cute and confident so they’ll like the look of you too. And that means having your face on. I’m not suggesting wearing the full works 24/7, just a little light make-up to boost your best bits and ensure you’re looking natural but pretty. I’m talking about the no make-up make-up look: that brilliant beauty trick that makes a girl look effortlessly attractive in natural, relaxed way. In a tight spot, there’s one girl I can rely on to help me out with any beauty worries – my mate, make-up artist Cassie Lomas. So I got straight on the phone to her and asked her to give me a lesson in “no make-up make-up” to ensure I won’t get caught out looking less than perfect any time soon. Cassie suggested staring with the Daniel Sandler Invisible Radiance Foundation and Concealer in Honey which gives a natural radiance to the skin. It’s really amazing because it’s got a concealer in the top, so once you’ve applied your base you can go over trouble areas with the concealer, and you know the colours are going to match because you’ve already got your base colour done. Cassie tells me that the best place to try out any foundation shade is on front panel of your face – meaning your nose or chin. Some people try it out on their hand but often hands are a different colour to their face so it won’t necessarily match well. And also it’s important that you graduate it down from your face and into your neck and chest. This look doesn’t have a hell of a lot of make-up on the eyes but there is little, and I used the Stila Smudge Pot in Kitten. Cassie showed my how to use my finger to blend a dab of this cream eyeshadow over the eyelids. It’s got a lovely sheen to it so it picks up the light nicely, making you look wide-eyed and fresh even when you’ve just had a big night out. Then its just a few strokes of Clarins Wonder Perfect Mascara – make sure that you comb your lashes through well in between each coat and it will make feature out of the eyes. Cassie persuaded me to try using some blusher. I almost always use bronzer (and I use a lot of bronzer) but it was such a good look that I’m glad I tried it. She used the Daniel Sandler Watercolour Blush – it’s a liquid blush and you can use the back of your hand as a palette and then apply it with the tip of your finger over the apples of your cheeks and a little bit down the bridge of your nose. It’s a brilliantly long-lasting product, so once applied it should stay on all day. To finish off the look you need a bit of something on your lips. Clearly you don’t want to go crazy with bright and strong colours. 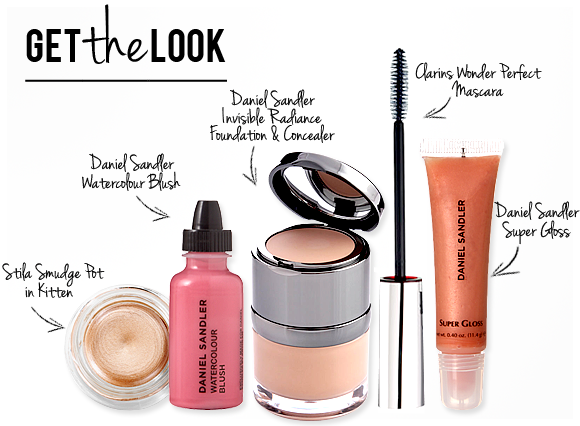 I just go for a nice lip gloss, like Daniel Sandler Super Gloss . You can paint this on with a brush and that pat your lips together to smudge it all over. And that’s it – sorted. Now, with any look Cute-Guy-Down-The-Road will come calling again. And this time, I’ll be ready for him! This entry was posted on Friday, September 28th, 2012 at 2:51 pm and is filed under Binky's Beauty Blog #BBB, Make-up, Uncategorized. You can follow any responses to this entry through the RSS 2.0 feed. You can skip to the end and leave a response. Pinging is currently not allowed. Loving this look, its so natural! Which was your favourite item from the make up used above?